In June 1865, rather than surrender, Shelby and approximately 1,000 of his remaining troops rode south into Mexico. For their determination not to surrender, they were immortalized as "the undefeated". Nathan Bedford Forrest. The father of mobile warfare. William T. Sherman said "After all I think, Forrest as the most remarkable man or Civil War produced on either side". And "Must be hunted down, if it cost 10,000 men and bankrupts the treasury"
The Sons of Confederate Veterans Mechanized Cavalry (SCV-MC) is made up of members of the Sons of Confederate Veterans who ride motorcycles and desire to find other like-minded persons who share their passion for motorcycles and their Confederate Heritage. We actively recruit members in good standing with the Sons of Confederate Veterans which is a group you must be born into. The entire Mechanized Cavalry has over 1,500 members in 19 States. We also have members in Spain, Holland, Canada, Wales, and Germany; natives of their respective countries. The SCV Mechanized Cavalry is not a motorcycle club (MC) but, rather, is a rolling billboard for the Sons of Condeferate Veterans. You'll see us on the roads throughout the South, attending heritage events, and even attending biker functions. We are among the most active of SCV members and we're very proud to honor our heroic ancestors. If you see us on the road or at a function somewhere, wave or say hello. If you ride a motorcycle and think you might be interested in joining us, ask us for information. We'll be happy to help those who share our passion and respect for our Confederate ancestors to "enlist" in the Cavalry. We do have back patches and rockers that may be worn at appropriate times and places. If your family is from the South you probably have a honorable confederate veteran in your linage. If your unsure we have qualified people that can help you with research and will put you in contact with a camp in your area. J.E.B. Stuart. One of the greatest cavalry commanders in military history. 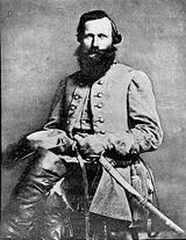 Union Maj. Gen. John Sedgwick said that Stuart was "the greatest cavalry officer ever foaled in America". While he cultivated a cavalier image his serious work made him the trusted eyes and ears of Robert E Lee' army and inspired Southern morale. William T. Anderson (Bloody Bill) Confederate guerrilla fighter. 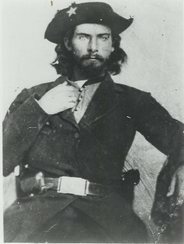 Anderson led a group that targeted Union Loyalist and Federal Soilders in Missouri and Kansas; he become notorious for the number of soldiers he killed and the brutality he demonstrated.